We are instrumental in offering a supreme array of MS Reactor to our valued patrons. These offered reactors are designed and developed using advanced technology and tools as per the set industrial standards and norms. The offered product range finds extensive application in various industries like chemical, pharma, bulk drugs, pesticides, herbal, dyes and others. Quality raw material is used in the fabrication of these products by our hardworking professionals. Established in the year 2008, we, “Maharashtra Enterprises”, are an esteemed organization involved in manufacturing and supplying quality assortment of Chemical Machinery and Vessels. The products offered by us are manufactured using quality material along with advanced technology that conform their adherence to industry quality standards and norms. Offered range of products consists of Pressure Vessel, Industrial Heat Exchanger, Reactor, and Jacketed Reactor, Steam Boiler, Vacuum Dryer, Cone Blend and others. 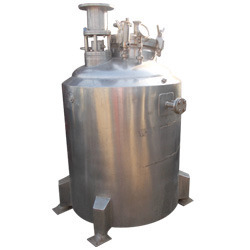 Moreover this range also comprises Stainless Steel Condenser, Stainless Steel Storage Tank, Centrifuge Machine, Stainless Steel Receiver and others. These products are widely accredited among the patrons for their attributes like smooth performance, low maintenance, easy operation and sturdy construction. Before the dispatch of these products at the patrons end, these products are thoroughly examined by a team of quality inspectors to ensure their flawlessness and error free nature.